HomeMagazine2018February 2018 Vol. 73 No. 2What About Infrastructure? In 2017, Washington politics continued as usual – if anything, even more bitterly partisan than ever before. Congress remains deeply divided down political lines and even among the parties themselves, crippling concerted efforts to accomplish the multitude of high-profile issues demanding immediate attention. Political issues and international threats abound, yet rhetoric and posturing tended to occupy the time of Washington. Unfortunately, the state of the federal government’s progress on key issues could adversely affect efforts to enact infrastructure funding legislation. During the 2016 presidential campaign, several candidates, bowing to rising public awareness and concerns, proposed the need for major infrastructure investment. Hillary Clinton was advocating spending $250 billion, while then-candidate Donald Trump advocated a $1 trillion public/private program. With Trump’s election, 2017 became a year of hope for infrastructure. That outlook quickly soured as an infrastructure initiative fell in line behind other areas of higher priority. While those issues are admittedly important, as 2017 progressed, infrastructure investment plans began to fade like a distant memory. For many cash-strapped cities around the country, spending plans quickly stalled when it became obvious no federal relief was anywhere in sight. In fact, it is more likely to be 2019 before any serious relief for infrastructure develops. Unfortunately, an inordinate amount of cities still look to the federal government as their primary source of income and funding to address sewer water, and stormwater infrastructure problems and needs. Years of inadequate spending and failure to increase user fees to keep up with maintenance simply have left thousands of cities in dire funding straits when the Environmental Protection Agency comes calling, or major projects cannot be delayed or ignored further. It’s no surprise then that funding woes dominated the minds of municipal infrastructure personnel responding to the 21st Annual Municipal Sewer and Water Infrastructure Survey conducted by Underground Construction magazine. In October and November of 2017 the survey polled U.S. municipalities about their top concerns and issues for 2018, along with infrastructure spending plans and working relationships with consulting engineers and contractors. This exclusive study also provides detailed insight of America’s cities through information and perspectives on industry topics and technology. The survey reflects only information regarding sewer, water and stormwater piping infrastructure and does not include figures or data on pumping stations, treatment plants, etc. Respondents ranged in size from rural communities of less than 500 to the nation’s four largest metropolises: New York City, Los Angeles, Chicago and Houston. Overall, new sewer spending in 2018 is expected to remain relatively flat. However, those spending plans vary greatly on a state-by-state basis. On the positive side, sewer rehabilitation spending should see small growth again on a national scale. 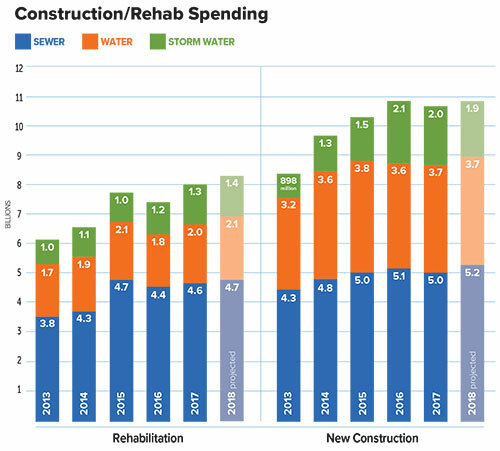 Overall, new construction and rehabilitation piping infrastructure spending is expected to increase by 1.5 percent over 2017 actual levels. As expected, government and Environmental Protection Agency (EPA) regulations were cited frequently by city officials as areas of high concern. But surprisingly, finding and retaining qualified employees was listed as an even higher problem area. For the potable water market, 2018 may see more concrete action spurred on from the EPA regarding the lead pipe panic coming from the Flint, MI, disaster. While the Flint crisis was artificially created (expect further punitive action again various authorities in 2018), it has drawn intense scrutiny across the country to the possibility of leaching lead pipes. In reality, the amount of active lead pipes is small and most of those pipes are in safe operating conditions. Nonetheless, the current train of thought is that any lead pipe must be replaced immediately. After the disappointment many experienced with their 2017 budgets and lack of movement to enhance federal and state funding support, city officials were understandably cautious with their spending projections for 2018. Survey information reports that cities hope to spend roughly $10.8 billion on new construction and rehabilitation for underground pipes. Sewer comprises $5.2 billion of that total, water $3.7 billion and $1.9 billion for stormwater/culverts. About $8.2 billion is anticipated to be spent on pipe rehabilitation, including $4.7 on sewer, $2.2 for water and $1.4 billion for stormwater/culverts. To illustrate just how much of a problem funding represents, the survey asked for an estimate of how much additional funding over current budget plans is needed to meet the many needs of both construction and rehabilitation of water and sewer infrastructure in 2018. Just for sewer, that amount topped $90 billion, water exceeded $50 billion and stormwater needs were $32 billion. In total, city officials estimate they need $172 billion to meet their needs for the next year. Raising water and sewer customer bills (user fees) is always a hot topic among cities. Never a popular move, historically cities have delayed raising fees, even to keep pace with inflation. Budgetary realities plus potential from EPA mandates have increasingly forced cities to swallow hard and raise user feeds. While the average amount of time between user fee increases has decreased, according to survey respondents, cities still averaged 3.1 years between increases. Buried asset management efforts continue to become more standardized as the technology of pipeline assessment progresses. Also, one cannot discount the influence of the Pipeline Assessment and Certification Program from NASSCO. PACP is an appealing and necessary standardization of inspection data that cities are steadily finding necessary to manage their systems. More than 40 percent of cities have a buried asset management plan fully established and operational, while 39 percent have such a program in development. The number of cities without an asset management plan has fallen to 21 percent. For many years, trenchless was the trendy choice for construction and rehabilitation of the underground sewer and water infrastructure. Today, trenchless methods are firmly established as reliable and often the best solution. During budget-crunching times, trenchless rehabilitation gained ground as a cost-effective and successful measure to stretch dollars. However, many survey respondents still express the belief that trenchless tends to be more expensive and are cautious in using it, due to budgetary concerns. Yet others saw some trenchless applications as “stop-gap” measures until they could afford to completely replace pipes. Still, the survey revealed that 54.1 percent of cities prefer to use trenchless for rehab, and for new construction trenchless remains constant at about 25 percent of projects. Municipal personnel were also asked about their perception of the quality and efficiency of a variety of popular trenchless methods, using a scale of 1 (low) to 5 (high). Achieving the highest performance rating for 2018 is cured-in-place pipe (CIPP) with a 4.4 rating – a huge jump from 3.8 rating in 2017. Horizontal directional drilling also received a major confidence boost, from 3.8 to 4.2. These are the largest trenchless applications by volume in the market. Also, rating well were manhole epoxy spray-on coatings at 4.4, followed by pipe bursting and piercing tools at 3.5. Historically, the municipal survey also asks city personnel to rate their contractor and consulting engineering partners. These relationships are critical to the success of virtually any project, regardless of whether it’s open-cut or trenchless. With tight budgets, municipalities count on their contractors and engineers to provide up-to-date, comprehensive solutions and options for their pressing needs. The survey tracks year-to-year ratings so contractors and engineers can gauge their perceived value to the municipal markets. The ratings are also based on a scale of 1 to 5, with five being the best-possible score. Consulting engineers continue to gain confidence with their municipal clients. For the third, consecutive year, engineers received a large jump in confidence to 3.7, compared to 3.5 in last year’s data. That continues a remarkable rebound from a low rating of 3.14 in 2014. Survey respondents were asked to rate the qualities they revere the most in consulting engineers. Quality was cited by a whopping 91 percent of all respondents. Timely completion of projects was cited by 68 percent, affordability was cited by 47 percent and effectiveness with the public was mentioned by 38 percent of the respondents. City personnel had several pieces of advice for consulting engineers. “Help us solve problems more quickly at a fair cost,” said this Southwest respondent. “Being up-to-date on new techniques and technology is extremely important,” said a city official from the Mid-Atlantic region – a common theme among many of the survey participants. “Ask for more input from the person paying the bill,” suggested one Midwest respondent, while a Northeast official cautioned, “Stop over designing, don’t reinvent the wheel.” “We prefer quality over quantity,” stressed a West Coast respondent. From 2013 through 2015, contractors’ performance rating was essentially flat. In 2016, however, municipal personnel gave contractors a big boost in their ratings, from 3.61 to 3.81. In 2017, cities continued to express confidence in the performance of their contractor partners and the rating jumped again to 3.9. Like engineers, city officials see quality as a major need in working with contractors. It was cited by 85 percent of all respondents. Following closely behind was the need for overall experience, which was cited by 76 percent of cities. Timely completion of project was cited by 50 percent of muni personnel. Low cost was only mentioned by 41 percent of the survey respondents. City employees also had plenty of advice for contractors. “Provide quality and efficient service at a reasonable cost,” suggested this Southwest respondent. “Being up to date on all the new techniques used in today’s construction world is critical,” said this Southeast official. “We’d like to see better field employees and superintendents,” added a Midwest respondent.